Fans were perturbed when they learned the classic Bullfrog-developed strategy series, Syndicate, would be rebooted in first-person form. The original was a beautiful and brutal affair, set in a cyberpunk world filled with corporate conspiracy. In its reboot, developer Starbreeze manages to hold onto some of those elements that made the original such an intriguing beast. Syndicate showcases its own beautiful brutality, shaking off the label of "just another shooter." It's 2069. Corporations have ascended beyond the reach of simple governments and battle one another for technological advancement. Civilians are inconsequential, seen merely as pawns in the midst of each company's boardroom brawl, and are often gunned down by characters throughout the campaign simply for "getting in the way." You take the role of the mostly faceless Miles Kilo, an agent at the industry giant EuroCorp, where you have been outfitted with a prototype version of a chip that gives you control over connected devices around you, as well as a number of other abilities. Like other agents, you must work to keep your corporation at peak profitability. Syndicate's story is all but standard for games revolving around the familiar dystopian theme. Syndicate's faults don't lie in a worn-out premise, however, but rather in its execution. Twists and turns in the narrative have the subtlety of a freight train. Syndicate does a great job of introducing so much promise, but doesn't do a lot to differentiate itself from other stories based on similar ideals. The ending is also rather abrupt, wrapping up so neatly and quickly that you're left wondering if something more interesting was left out. Purely from a narrative perspective, the game is disappointing. What's not disappointing is actually playing inside Syndicate's wondrous, kinetic world. It's a matter of personal taste, but developer Starbreeze has a solid track record in my book. Here the developer's sense of style and devastation translate into yet another gritty, beautiful thriller. The guns handle extremely well and offer interesting secondary functions. Kilo can run and slide into enemies, knocking them back, and even land gruesome melee executions -- an element Starbreeze fans have probably come to expect. There's also a cover system similar to recent FPS titles, but I rarely ever felt compelled to use it. As part of Kilo's prototype chip, he can access an overlay that paints enemy positions in the world whether they are hiding behind cover or not. Activating this mode also slows down time, increases Kilo's damage and health regeneration rate, and it's is essential for solving some of the game's few environmental and boss-focused puzzles. Hacking into devices is a major component of Kilo's arsenal, but there is no minigame here. Simply hold down a button to get the job done. Its simplicity works if only because you'll do it a hundred times. But the real shock value, if you want to label it as such, comes from Kilo's abilities. There are only three primary abilities to use against enemies: backfire, persuade, and suicide. Backfire causes an enemy's gun to short upon firing, sending them to the ground for a moment. Suicide, as you might have guessed, allows Kilo to tap into the installed chips of his enemies and force them to take their own lives. 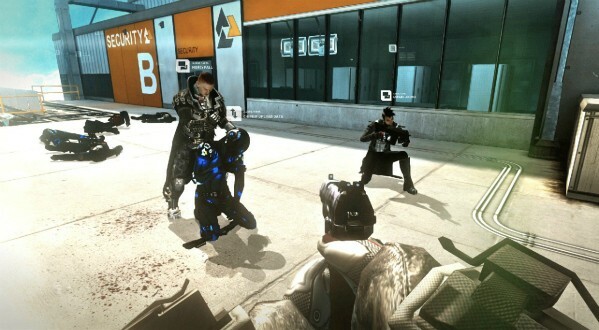 Persuade forces enemies to ally with Kilo for a short time, committing suicide if they end up being the last man standing. Strategy is key for each ability and varies based on the enemies in Kilo's path. For some enemies -- such as bosses -- the abilities won't work at all. Actually, here's the real shock: I had a lot of fun with most of the boss battles in Syndicate. At first, each encounter is a controller-chucking affair. Eventually, you learn that bosses require you to correctly use Kilo's abilities and understand the rules of the powers they use against you. A few of the battles devolve into circling and firing directly into the enemy's face, sure, but those battles didn't sour me on the overall experience. Syndicate's co-op is an entirely different animal. Up to four players can jump into nine different missions where an up-and-coming corporation battles against its more established competition. It's possible to run through these missions alone, but even seasoned agents will have a hard time surviving. Like other co-op focused titles, Syndicate puts a premium on working as a team. Agents have access to a host of new abilities and upgrades that aren't featured in the single-player. Last night I spent hours with two other players pushing through this mode, surprised how engrossed I had become. Missions revolve around a handful of objectives: kill people, protect something, or fetch essential things. On paper this sounds bog-standard, but it captivated my attention. Without fail, the lone wolf approach always resulted in catastrophic failure, but working with a team and formulating a strategy to defeat bosses and complete goals was completely gratifying. The rub, though, is that difficulty doesn't seem to scale based on how many players are part of your group, and there isn't much variation in enemy attacks. Having to restart sections a few times, I noticed the same enemies were coming from the same place every time. If things were more dynamic, I could see myself returning to the co-op again and again. As it stands, I can see things getting stale over time. Starbreeze may have opted to go the route of this generation's most profitable genre for its Syndicate reboot, but the soul of the series has survived. Its well worn narrative trappings hold your attention for the most part, but the real treat is in the execution of Syndicate's gameplay. Syndicate manages to mesh the spirit of the old with the style of the new. It's not the return some fans would have hoped for, but it expands the franchise into new territory where business is booming. This review is based on a retail copy of Syndicate for Xbox 360, provided by Electronic Arts.